Jessica wrote: I’ve heard a lot about “sand ceremonies” but have not seen one done. How does that work? There are likely many approaches to a sand ceremony. The way I suggest it be presented is quite similar to a unity candle. With a unity candle, I talk about how two individuals are represented by the individual flames. And, just as the the flame they are creating (on the pillar candle) can no long be divided – let their lives not be divided. 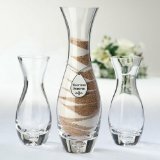 In a sand ceremony, there are typically two colors of sand blended into a common vase by the couple. And, just as those grains of sand can no longer be divided… Well, you get the idea. If you are looking for unity sand sets, try Amazon.com. Hobby Lobby also has colored sand and a good selection of glass containers. We did a sand ceremony because we got married outdoors and didn’t think unity candle would work in the wind.